Rental property owners are always surprised and shocked to find their property in a hoarded, cluttered up, gross filth state after gaining back possession from a tenant. These situations occur mostly after an eviction or when a homeowner is located out of town, but this does occur much to often by a tenant who has destroyed the property beyond normal wear and tear. Owners are left feeling betrayed and they do not know what to do next. Hoarder Rescue offers our services to all property owners of rental properties, short sales, foreclosures, etc. After the tenant or former homeowner vacates the property and it is left in disrepair, riddled with trash, furniture, gross filth and discarded items, our team is ready to clean it up for you. We can remove trash, furniture, carpet, appliances, cabinetry, etc., from the interior or exterior of the property including garage, storage sheds or attics. Storage shed demolishing is also available. We can provide dumpster service and trailer service as needed. If personal items are left behind that need to be kept by the property owner for a specific time frame, we can pack those up for you and take them to a storage unit. Hoarder Rescue will not only clean out the property for you quickly, but we will clean it up with a heavy duty cleaning and disinfection, so that you can begin necessary repairs and replacements to help avoid further loss of rental income or prepare your investment to be sold with as little time lost as possible. In these situations we understand that time is money. We can board up broken windows or doors and change locks as needed. Our team can have your property cleaned up in as little as one day depending on the size of property and the extent of damage. 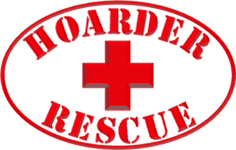 Please contact Hoarder Rescue for a free rental property cleaning estimate.